Jim Henson’s life and work - full of fun, joy, energy, and a rich sense of humanity - speak to the child in all of us. As well as a very gentle and caring person clearly devoted to children, he was a very imaginative artist. 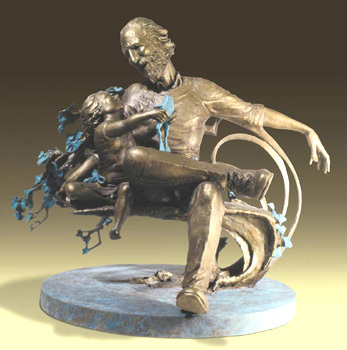 This sculpture shows a young girl holding a frog up to her amused father, a portrait of Jim Henson. They sit on an Art Nouveau park bench entwined in an array of dancing ivy. The concept was conceived being surrounded by a black granite pool and bronze water lilies, frogs and fish.